by Ben Sparks, https://www.geogebra.org/u/sparksmaths . Click on the illustration to see and use this app. 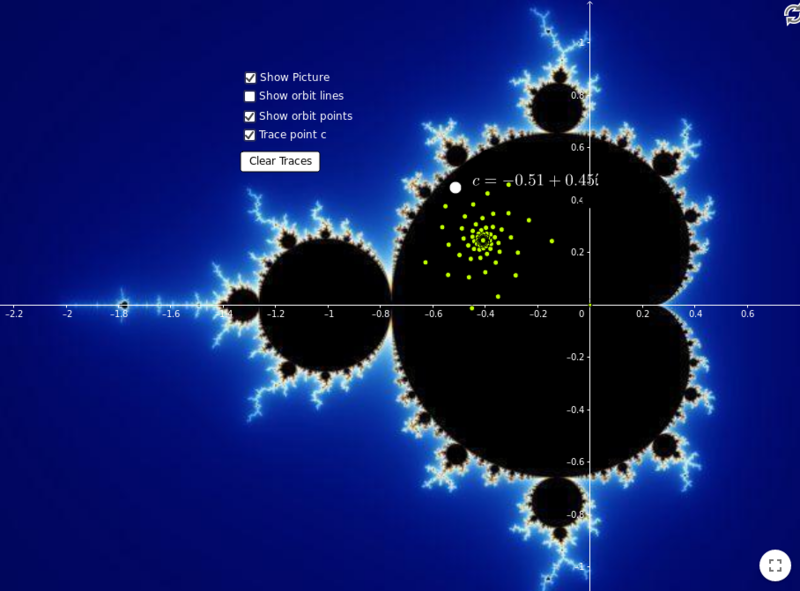 There is a Geogebra app written by Ben Sparks which can run on your browser. 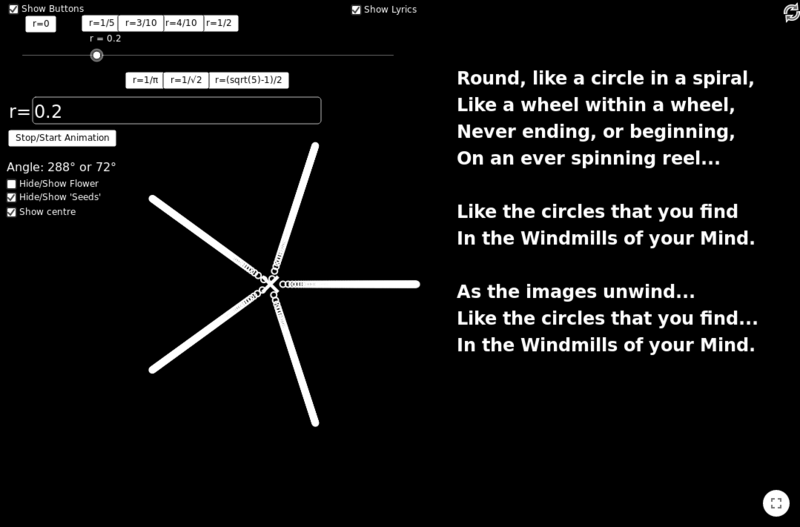 There are many facets to this app, such as an animation of “circles within circles”. 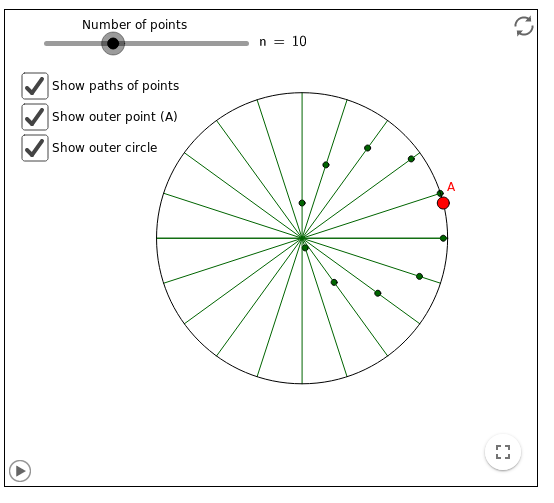 When this app runs (see the screenshot on your left), the dark points appear to move together in circles, but are really moving in straight line segments along the green paths. The red point A is the only point actually moving in a circle. The number of dark points can be controlled. When reduced to two points, the positions of them resemble the sine and cosine of angles if the red point was on the terminal arm of an angle in standard position. A circle of dark points can be formed from the points of intersection between a perpendicular passing through A and any line. There was another one to do with a Mandlebrot set and a complex coordinate plane, even offering a “painter” which colors the canvas from black to blue when the iteration forming the spiral goes from stable to unstable, or from a cohesive spiral to one whose points are scattered as you drag a point C with your mouse over the coordinate plane. The points converge on a single point at the origin. When r is rational, it doesn’t lead to much of a spiral. Lyric snippet on the right. The last and my favourite, is one called a “sunflower spiral”. Apart from checkboxes, a text box for numeric input, and a “start/stop” button to control the animation, there is another checkbox which says “show lyrics”. They are the lyrics to the 1968 hit song “The Windmills of Your Mind”, which first appeared as the theme to the movie The Thomas Crown Affair, and sung by Noel Harrisson, and won an Academy Award for best original song. I won’t bore you with the lengthy list of vocalists who have covered it since, but I can provide a link if you really want to know that and other details. The idea here is, imagine a flower with many, many seeds, like a sunflower. As it distributes more and more seeds, it must do so from the centre, pushing the seeds it has already deployed, more and more to the outside. Seeds thrive when they are further apart, so that they may take advantage of greater food availability. 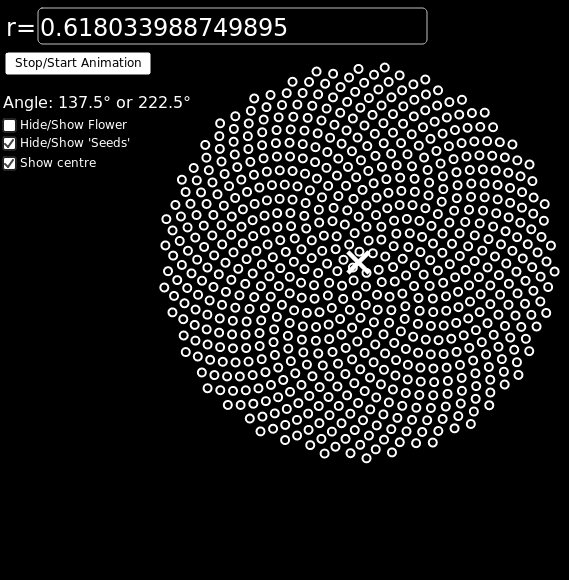 This app appears to mimic a flower which distributes its “seeds”, symbolized as small circles, based on the distance from the centre and the amount of rotation based on the desired amount of seeds per turn. The number of turns has to be a number between 0 and 1. So, if you want 5 seeds per turn, seeds are distributed every 1/5 of a turn, and so you enter r = 0.2 in the text box. However, this means that, rather than spirals forming, you get spokes, as in the illustration above. 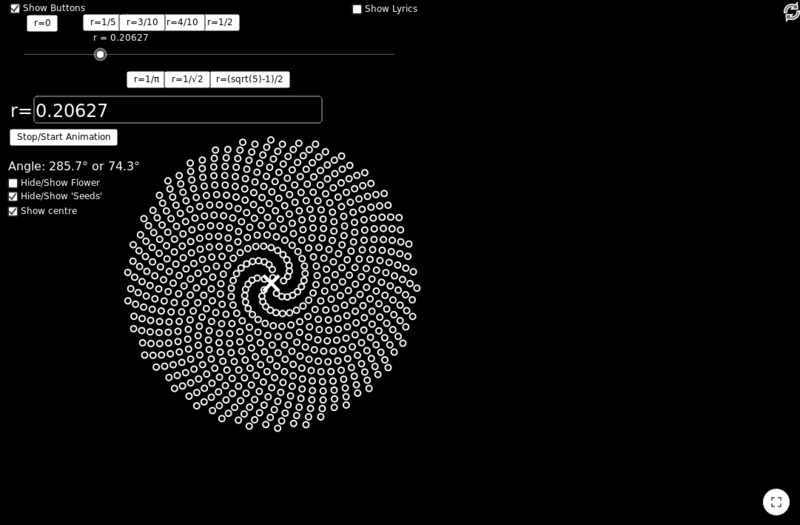 However if you let it run for a bit, it does a fine iteration to six decimals, and you begin to see spirals bending, disappearing and re-forming, as in the illustration to the left, with a number like 0.206270. This is still a rational number, since the decimal terminates. Notice that the centre of the “windmill” still has “spokes”. That might still be because 0.206270 is still close to 1/5, or 0.2. The outer “seeds” seem to arrange themselves in such a way that any one of them are members of at least two kinds of spirals, criss-crossing each other in opposing directions. On the left, the irrational number [latex]\pi-3[/latex]. On the right, the irrational number [latex]1/\pi[/latex]. is another number thought to be highly irrational. Not irrational enough to scatter the seeds, as they fall in an orderly fashion and too close together for both (above left) and (above right). 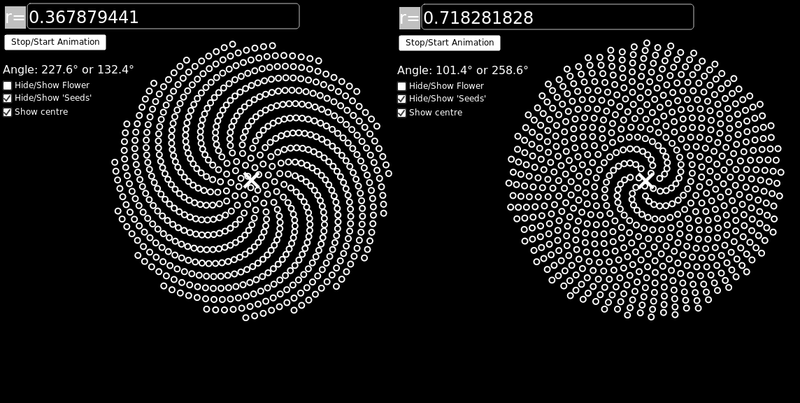 Strangely, the spiral on the right has 7 “spokes”, and the one on the left has 22 “spokes”. If you recall your high school teacher telling you that an approximation for is , I am not sure if that has anything to do with it. “Windmills” created using Euler’s constant. 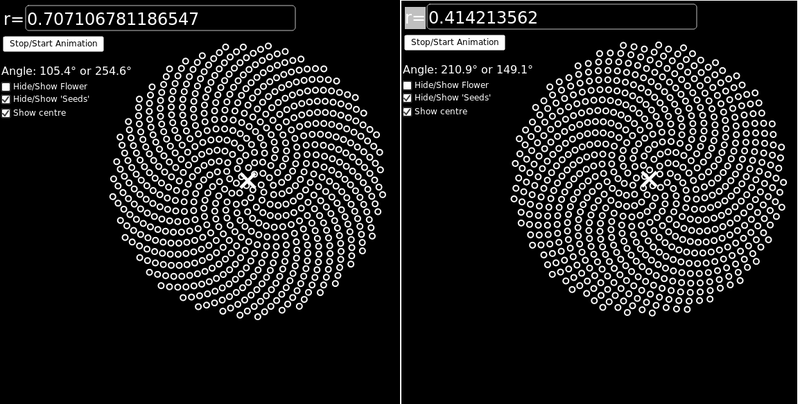 Another candidate is Euler’s constant, e. I tried (right) and (left), and both looked somewhat more satisfying. They still had distinct spirals somewhere in the seed distribution. When I say that the spirals are distinct/not distinct, I mean that the eye is drawn less and less to one particular spiral. But the seeds are overlapping a lot less, though there is still some overlap. This one is based on the square root of 2. The irrational number can be applied, and here, it is applied as (left), and (right). This seems to be the best so far, as the spirals get less distinct, and the seeds appear to be spread further apart still, not seeming to touch anywhere. “Windmill” based on the golden ratio minus one, or its reciprocal (same number). For the golden ratio, this time the decimal was simply stripped from the number. Their button says , but this is the same as , oddly enough. The “seeds” appear to have the best distribution. I had the feeling this is true of any number , where n is a prime number, or at least a number that is not a perfect square. I had no luck, however, after trying 2, 3, 6, 7, and 11, and using the decimal or taking the reciprocal. Of course, the metallic means have numerical properties similar to the Golden Ratio, and two others were tried. The reciprocal of the Silver Ratio, was already tried, and worked well (see above). The Bronze Ratio, , led to less satisfactory results. Metallic means follow the formula , for any positive whole number n.